Two years ago I wrote these thoughts about where we’re going in promoting veg*ism worldwide – not necessarily what I think should happen, just what it appeared was already happening. I’ve updated a couple of minor points, otherwise it still stands. a) Small groups – those whose income is mostly from members’ subs. b) Larger groups – those with significant other sources of income. The smaller groups traditionally collect subs to cover the cost of printing and posting newsletters, but now that most people are online they are increasingly using email and websites which are free. Very few of the new start-up groups are now following the traditional structure, they just use meet-up style online news and networking. Some long-standing traditional societies have also scrapped all the bureaucratic systems and gone online only, many just calling themselves Anytown Vegetarians/Vegans, instead of ‘Veg Society’. The bigger groups are moving towards the non-profit business or agency model, which is what in reality they are if they are not relying on member subs for their main income. Very few new veg societies of any significant size have emerged in recent years, as most of the bigger groups are now avoiding the pretence of democracy maintained by the older groups – where only a tiny number of members ever bother to vote, and the same few try to manipulate everything. The indications from the bigger traditional groups is of a declining membership, whilst those following the non-profit business/agency model are attracting large numbers of highly mobile ‘supporters’ who have no interest in voting for ‘leaders’ – if they don’t like what the organisation is doing they just take their support elsewhere. 2 – there will be an increasing prominence of online-only veg organisations, both profit and non-profit. Usage figures show that traditional real-life veg groups are generally not very good at attracting visitors to their websites – the most popular veg websites (with the odd rare exception) are all run by a small number of people with no real-world organisation behind them (vegsource.com and happycow.net are among the best examples of that). Some of them, like Vegsource, then move on to promoting real-life events as well. This is happening everywhere, not just in the veg movement, a typical case would be to consider the advance of amazon.com compared with high street book stores. This will also add increasing pressure to traditional veg*n societies as they will struggle to compete with much more efficient online resources offering everything for free. 3 – a much higher proportion of vegetarians will exclude eggs/dairy. The latest detailed survey from VRG shows that in the USA, over 60% of those who were genuinely within the broad definition of vegetarian (optional eggs/dairy) were in fact eating plant-foods only (apart from some still using honey). This reflects a major shift in recent years. What happens in the USA usually goes everywhere else before too long – and inevitably those mostly younger people show the trend for the next generation of adults. However this will still not help the traditional vegan societies as most of this next generation will be less interested in joining traditional societies, as they will have grown up in an online world. Photo right: from the 2010 IVU World Congress in Jakarta, Indonesia. Everything above suggests that that traditional vegetarian and vegan societies will be left with an ageing and declining membership in the coming years. All the above also has implications for the International Vegetarian Union (IVU), which was founded in 1908 as a union of all world’s vegetarian societies. Clearly IVU will have to rethink its role when those societies disappear – and less than half of the current member organisations now appear to be using the traditional ‘democratic’ structures. 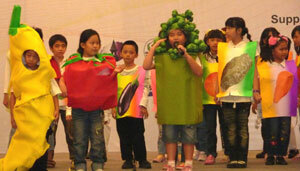 4 – there will be a continuing increase in big veg trade fairs. In the past we had congresses with a few stalls thrown in as a bit of an afterthought. Now we’re getting very big trade fairs with lectures as optional extras, some of which are very professionally run and counting attendances in tens of thousands. The money from the trade stalls covers the cost of the lectures, and allows for paying expenses to top quality speakers – a big advance on simply relying on registration fees to pay for the lecturers. 5 – a further rise of Asian led spiritual/business organisations. 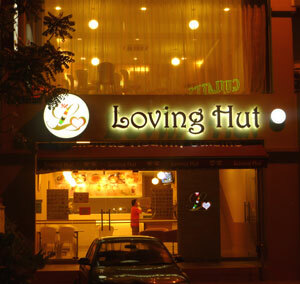 The most dramatic example can now be seen in the Loving Hut restaurant chain – currently 207 eateries in 29 countries (up from 166 in 19 countries two years ago), by far the biggest vegan restaurant chain the world has ever seen and still expanding rapidly. The Loving Huts are run by the followers of Supreme Master Ching Hai. Along with other examples, this Asian style combination of business and religion is having a significant impact globally. Add to that the Govinda restaurants run by Hare Krishna followers, lacto-veg but plenty of vegan options, and now with at least 60 restaurants in 30 countries – and a lot more at various times in the hundreds of temples and food relief programs. There are of course countless thousands of independent veg restaurants and smaller chains, but a serious worldwide challenge to multinationals like McDonalds, KFC etc. is only going to come from similar global franchises offering a veg alternative. As I said at the beginning, this is not necessarily what I think should happen, merely what is already going on. I look forward to some comments below telling me I’ve got it all wrong – it will be interesting to see what others think the future holds.